The aim of this article is to provide you with the basic knowledge and examples that you will need to use the SQL join effectively in any database environment. The ability to combine results from related rows from multiple tables is an important part of relational database system design. 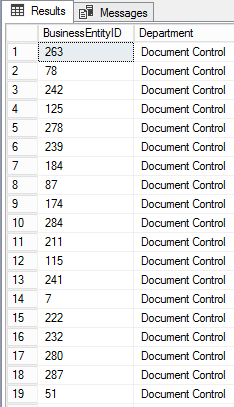 In SQL Server, this is accomplished with the SQL join clause. It’s the nature of traditional relational database systems where some table contains information related to other tables with a common key value. Using a SQL join, you can easily perform queries on related data-sets from multiple tables with these shared keys. Note: The keyword outer is optional. It means you can specify the keyword “outer” or not makes no difference to the query execution. The simplest and most common form of a join is the SQL inner join the default join-types of most of the database management systems. It’s the default SQL join you get when you use the join keyword by itself. 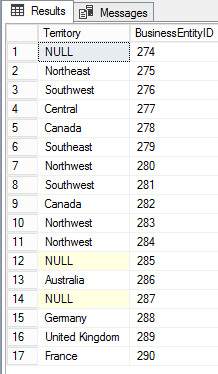 The result of the SQL inner join includes rows from both the tables where the join conditions are met. 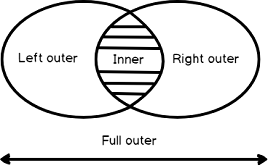 Note: It is very easy to visualize a join query as a Venn diagram, where each of the tables is represented by intersecting shapes. The intersection of the shapes, where the tables overlap, are the rows where a condition is met. 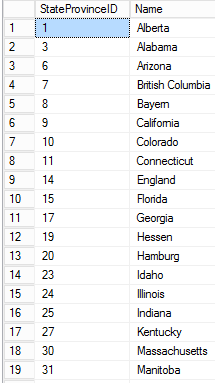 Unique columns (ID) are often used for this purpose, where the condition to be met is matching the ids of rows. An equi join is the most common form of SQL inner join used in practice. If the join contains an equality operator e.g. =, then it’s an equi-join. The following example returns all matching state names and stateProvinceIDs. 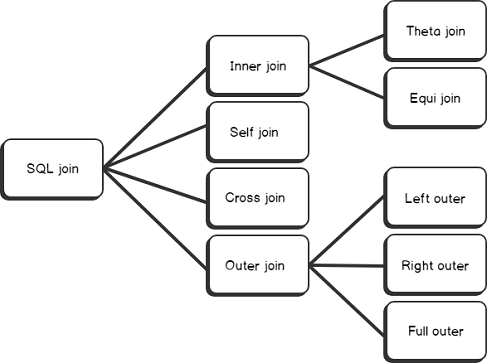 A SQL Self join is a mechanism of joining a table to itself. You would use a self join when you wanted to create a result set joining records in the table with some other records from the same table. A CROSS join returns all rows for all possible combinations of two tables. It generates all the rows from the left table, which is then combined with all the rows from the right table. This type of join is also known as a Cartesian product(A*B). For example, if the left table has 100 rows and the right table has 100 then the cross join result will yield 10,000 rows. 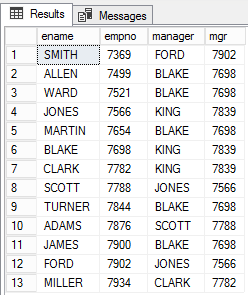 On joining tables with a SQL inner join, the output returns only matching rows from both the tables. 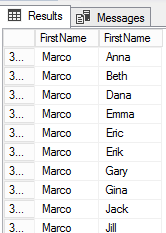 When using a SQL outer join, not only it will list the matching rows, it will also list the unmatched rows from the other tables. A SQL left outer join will return all the records from the left table in the join clause, regardless of matching records in the right table. The left SQL outer join includes rows where the condition is met plus all the rows from the table on the left where the condition is not met. Fields from the right table with no match will be displayed as null values. The following example joins two tablesProduct and SalesOrderDetail on ProductID and preserves the unmatched rows from the left table. 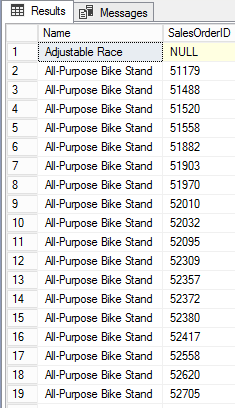 The Product table is matched with the SalesOrderDetail table on the ProductID columns in each table. All products, ordered and not ordered, appear in the result set. The following example joins two tables on TerritoryID(SalesTerritory) and preserves the unmatched rows from the right table(SalesPerson). The SalesTerritory table is matched with the SalesPerson table on the TerritoryID column in each table. All salespersons appear in the result set, whether or not they are assigned a territory. 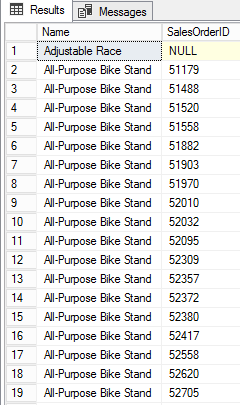 The following example returns the name of the product name any corresponding sales orders in the SalesOrderDetail table from the AdventureWorks2014 database. It also returns any sales orders that have no product listed in the Product table, and any products with a sales order other than the one listed in the Product table. In this article, we’ve discussed most of the important aspects of SQL Joins. We’ve also demonstrated a few quick examples and samples of how we can pull data from related tables from the Adventureworks2016 database and how those tables actually get that relationship through the use of those keys using SQL joins. That’s all for now. I hope you enjoyed this article on SQL Joins. Feel free ask any questions in the comments below, and happy joining!